The Compulsive Reader: My ROOMIES Story! 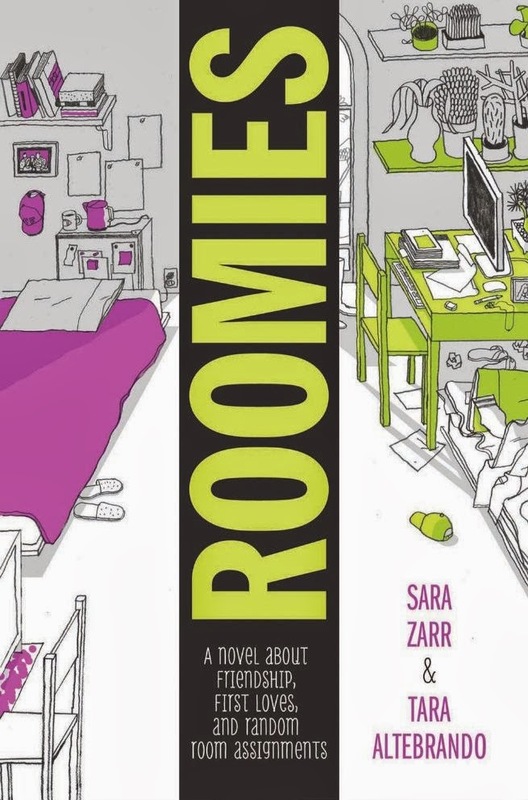 One of my favorite books of December was Roomies by Tara Altebrando and Sara Zarr! It's a great, fun book about two girls from the opposite sides of the country who begin emailing each other the summer before they become roommates in college. You can read my review here! I really, really enjoyed Roomies, and not just because the writing is sharp, witty, and really heartfelt. I never had the dorm experience that EB and Lauren are about to embark on, and reading their story was a way for me to live vicariously through them. My roommate experience came after college, when I started graduate school. Most people are past living in dorms, communal showers, and randomly matched roommates by the time they are in graduate school, but my program at Vermont College of Fine Arts in unique. We come together twice a year for ten day residencies and while we are in Vermont, we stay in a dorm and we get a roommate! When I went to my first residency, I was too nervous/excited about the whole experience to allow myself to worry about the fact that I was getting a roommate for the next almost-two weeks, and unlike EB and Lauren, I had NO IDEA who it was going to be. No name. No email address. No contact. I showed up to residency, lugged my suitcase up two flights of stairs, wandered the halls until I found room 208, and there was my name on the door next to the name Courtney Rogers. And then I started to worry. Would she like me? Were my habits annoying? Would I snore? Luckily for me, Courtney is the most perfect roommate I could have wished for, and if I snore, she has not brought it up. Despite our nerves and the stress of orientations and the avalanche of information we had to process, we clicked and had a lot of fun. Our second night of residency we returned to our dorm room, shut the door behind us, and confessed our nerves and relief that had struck gold on this particular residency experience. Courtney is kind and sweet and deceptively, subtly hilarious. She also doesn't complain when I get up in the morning before her, or when my side of the room is an utter mess. She's pretty awesome. It's quite fortuitous that today is Roomies day, because today is also the day that I jump on a plane headed back to snowy, cold Vermont for the January residency and I cannot wait to see my fantastic roommate again! See you soon, Courtney (and all of my fantastic VCFA friends)! To celebrate Roomies (both the book and the people), I'm giving away one copy to a lucky winner thanks to the generosity of Little, Brown. Just fill out the form below! Do you have a roommate experience to share? Tell me about it in the comments! It's so true, Vermont is cold and snowy (but it's supposed to be in the 50's tomorrow so I'm not complaining). I moved out of state for my first roommate experience and it was awful...but somehow I managed to switch rooms and get the most fabulous roommate possible and we still meet up every year despite a 5 hour drive between us. This sounds like a great read! I can't wait to read this one! I love books that take place at the beginning of the "college years."